Description: Starting in 2007, Team Echinacea has been investigating naturally-occurring emergence of seedlings and their subsequent survival and growth in remnant prairie populations. It began with a pilot study in 2006 to determine methods and then moved on to data collection in 2007. From 2007 to 2013, Stuart selected focal individual plants that had flowered the previous year and the team went out in the late spring and searched for seedlings surrounding the focal plants. They mapped out new seedlings (sometimes finding more than 40 new plants!) 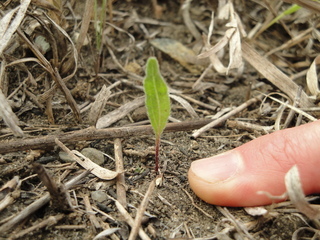 then came back in late summer or fall to assess survival of new seedlings and those found in previous years. From 2007 to 2013 team members found a total of 955 seedlings. The first of these seedlings to flower was an individual from the 2007 cohort that flowered in 2013; since then several others have flowered. In 2014, we stopped spring searches for new seedlings because we have a great dataset and it was so labor-intensive and time-consuming. Since 2014, every year in late summer or fall team members continue to refind the plants that were originally found as seedlings in 2007 to 2013.